THE FRENCH LIEUTENANT’S SLAUGHTER: The prevailing generals of ATP tennis are from Spain, Serbia and Switzerland. In contrast, France gives us lieutenants – wonderful but lesser players, just below the elite. French players often are crafted to be flowing artists who tend to give us gracious shots and astonishing leaps rather than championship trophies. There are few more charismatic players then Gael Monfils. John Isner was not pleased when Americans backed him at the US Open. Former Australian Open finalist Jo-Willie Tsonga, with his big serve and wide smile, Richard Gasquet, with his dreamy backhand, and silky Gilles Simon have thrilled us. But no Frenchman has won a Slam since Yannick Noah in 1983 – what a drought. Yet, French tennis not only fashions some of the most appealing lieutenants in the game, they provide a deep bench. It used to be names like Clement, Forget, Santoro and Grosjean. More recently it’s Benoit Paire, Jeremy Chardy and a dreamy fellow with blue eyes, a backward cap and an appealing personality. Okay, prior to this year’s Aussie Open, Lucas Pouille had only once made it to the fourth round of a Slam and he’s only ranked No. 28. But it always seemed as if he was making waves. He scored an epic Labor Day Weekend five-set win over Rafa Nadal in 2016, thrilled his countrymen with his Davis Cup heroics, was a feminist good-guy when he recently hired Amelie Mauresmo as his coach, and said that it was character and knowledge of tennis, not gender, that mattered in coaching. Pouille was also one of most outspoken critics of the new Davis Cup format. This year he got off to a terrible, winless start Down Under at the Hopman Cup and the Sydney warm-up tourney. But here, he took advantage of a sweet draw to reach the semis. Tonight, on Laver Arena, was a mismatch. The general, who now lives in Monte Carlo, pulled rank and beat the lieutenant 6-0, 6-2, 6-2. It was Nole’s 28th straight win over a Frenchman. Now, after most all of the Aussie Open dust has settled, now that an icon has announced his retirement, now that all the Next Gen players have again fallen short, now that we are recovering from Serena’s shock defeat, and assorted controversies have died down, the men’s final will give us perhaps tennis’ greatest match-up. Novak leads 27-25 in his rivalry with Rafa Nadal. In 2012 Nole came from behind to beat Rafa in 5:53 in one of the best matches ever. It remains the longest Grand Slam final ever, and, with all the new rules, it could stay that way – maybe forever. And Novak’s epic 5:15 two-day, 10-8 in the fifth at Wimbledon was probably the best match of 2018. 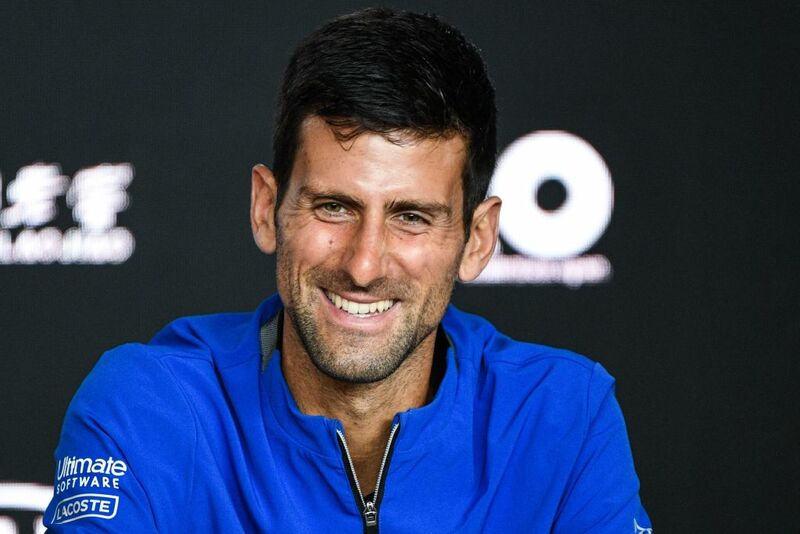 Djokovic’s slump, that lasted until the 2018 French Open, seems like an eon ago – and he’s had relatively easy back-to-back outings in the quarters and semis against Kei Nishikori and Pouille. But Nadal is on fire. His forehand has never been better, his serve has improved, and he dismantled Frances Tiafoe and the streaking Stefanos Tsitsipas to reach the final. Goodness, one theory has it that the new “get on with it” serve clock has helped him. So let’s do a deep dive on the singular Spaniard. DAVIS CUP WORRIES: Rod Laver, long a stalwart of the Davis Cup, said, “it just seems like it’s getting lost, you haven’t got someone in there fighting for the Davis Cup, they are fighting for different events.” In that same vein, a quartet of famous singers – Boris Becker, Mats Wilander, Henri LeConte and the guitar-strumming John McEnroe, did a cover version of the Bob Dylan’s song Knocking on Heaven’s Door in defense of the traditional Davis Cup. WHITEWASHING NAOMI: Naomi Osaka is of Japanese and Haitian origin. The star does not have a light-skinned complexion. But at times she’s been portrayed that way. The latest example came recently when Nissin, a big Japanese noodle company, had her looking pale in an animated commercial. There were loud complaints, the ad was pulled and the company said they wouldn’t do that again. FEEL-GOOD DOUBLES: It’s an extraordinary story that Bob Bryan, 40, has been able to come back from serious hip surgery. He and twin brother Mike made it to the quarters before falling to the formidable duo of Pierre-Hugues Herbert and Nicolas Mahut. The Frenchmen are now in the finals, and if they prevail they will achieve a career Grand Slam. Australian fans were thrilled by the doubles win of veteran Sam Stosur, who teamed with China’s Shuai Zhang to claim the women’s doubles title.